I can hardly take it in, but our Angelo is gone. He was euthanized last Monday. As some of you may recall, routine blood tests done before his dental work last fall showed Angelo's kidneys were not quite up to snuff. After that we changed his diet, he received special supplements, and I increased his daily doses of lactulose, a stool softener to help with chronic constipation. In December he started receiving hydration therapy, saline solution injected under the skin to help compensate for the fluids the kidneys were not putting back in the bloodstream and the toxins they were not filtering out. He got this therapy once a week. (He hated the short trip in the car but didn't seem to mind the procedure itself.) He seemed to be maintaining but when I came back from a trip out west, helping my daughter drive her new car (our old car) to California to her new duty station, Angelo was clearly feeling lousy. He wasn't even eating. That was in the middle of May. We increased his hydrations to three times a week. 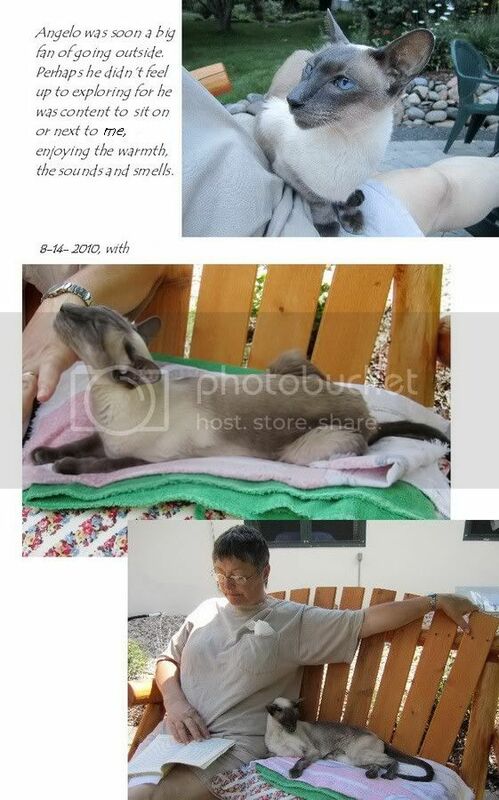 The thrice-weekly fluid therapy helped him live pretty comfortably all summer, truly a summer of [cat] love. But it wasn't a miracle cure; his appetite began again to decrease so that he became thinner and thinner (not a fat cat, he lost four and a half pounds by the time he died). Still, he really did enjoy the summer and so did we. Finally, though, he entered true kidney failure. I could see him failing in spite of the hydrations, day by day, more weak and thin. "His eyes are looking sad", I sighed to the technician as September advanced. He was still happy to be held or when nestling next to us, craving comfort and warmth, but that was not possible twenty-four hours a day. The rest of the time he looked sad. "Not a happy camper," as people say up here. I won't be posting his really thin, sad pictures here. This post is meant to be an appreciation of his life, to warm the hearts of you who've lost pets, not to make you miserable and sad. My husband and I took Angelo to the vet's to die last Monday. Late that night I wrote to my real life friends and family about it. Here's a bit of the version I sent to our daughter, who is at sea (she's in the Coast Guard), but can receive text-only emails. Darling, Angelo died peacefully at the vet's today, late in the afternoon. (...) I keep thinking I'm all sobbed out, but keep getting weepy. How I'm going to miss my lovely boy. (...) All day today I kept fantasizing about Angelo's death to come, or remembering the deaths of Arvo, Friedrich, Raoul and Pixie [our cats who have died since we moved here in '99], and bursting into tears. But I didn't want to make Angelo nervous or worried, so tried to keep busy, doing chores, talking to the roofer (we're going to be getting the roof replaced), puttering, cleaning, all the while constantly resisting the desire to pick Angelo to squish him. I had tried just sitting in the living room with him in my lap, which was o.k. until he'd get into a comfortable position, look up at me with that rapturous "I love you!" look, like Raoul used to give you, and I'd start weeping all over again. 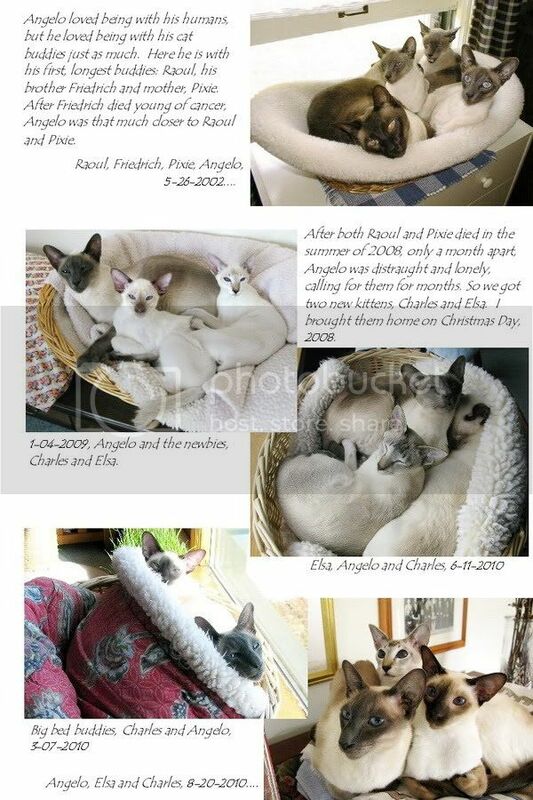 Luckily, Elsa and Charles were in a mellow mood and settled down for their naps, which Angelo joined, all of them settling into the basket on the coffee table in front of the window. We did get to go outside one last time - Angelo got to love going outside, sitting with me in the sun. In fact, he had wanted to go out when the roofer came over this morning, but I couldn't supervise him while I talked to the roofer, so I promised him, "later". But the sky clouded up and grew dark after lunch. A short thunderstorm was followed by steady rain. Angelo couldn't go out (he hates it when it's chilly or wet). But just before 3:00, the sky overhead cleared and the sun came out. The sky over the lake was still very dark but everything in the foreground was brilliantly, richly lit, the wet grass, flowers and fall leaves saturated with colour. After crying that he didn't like the wet pavement, he sat on my lap in a blanket and enjoyed the sun until it was time to go. The gusty wind was gone, so the sun was really warm. When a little breeze would come, he'd sniff appreciatively, his eyes closed, then put his head back on the blanket. The birds sang, bees buzzed, it was lovely. So, apart from feeling generally low and lousy because of his illness, I think he enjoyed his last day very much. Dad and I feel we didn't wait too long this time (way too long for Arvo, too long for Friedrich and perhaps a little too long for Raoul), so that Angelo died just before he began to feel truly miserable. So we're glad about that. But I am so sad he's gone. He was a great cat, maybe my favourite ever, so talky (did he ever shut up? ), affectionate, and just such a character. How I'll miss him. I asked the technicians to cut some snippets of fur for you, like they did for the other cats, which I will send when you get back to port. We've taken lots of pics and videos since you sailed, too, that you haven't seen, but there's no sense sending those until you can open them. 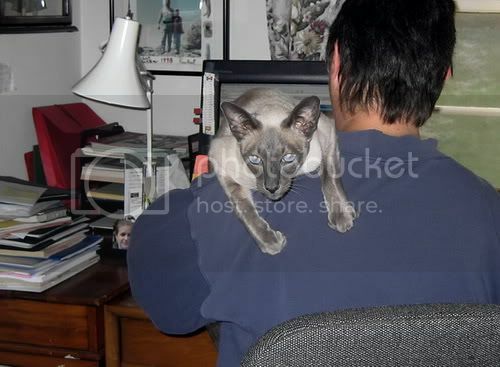 It's been a week, but every time I walk into the dining room and my husband is at the computer, I am a little taken aback that there is not cat on his shoulders or in his lap. When I sit in a chair, no cat immediately jumps in my lap. When I start pulling the covers down at night, no cat leaps upon on the bed, anxious to take his place on "his" pillow. No cat meows as I approach the laundry room door in the morning to let them out, no cat dashes to the front door when I open it to go out. I'm not sad or weepy anymore, but I miss him. 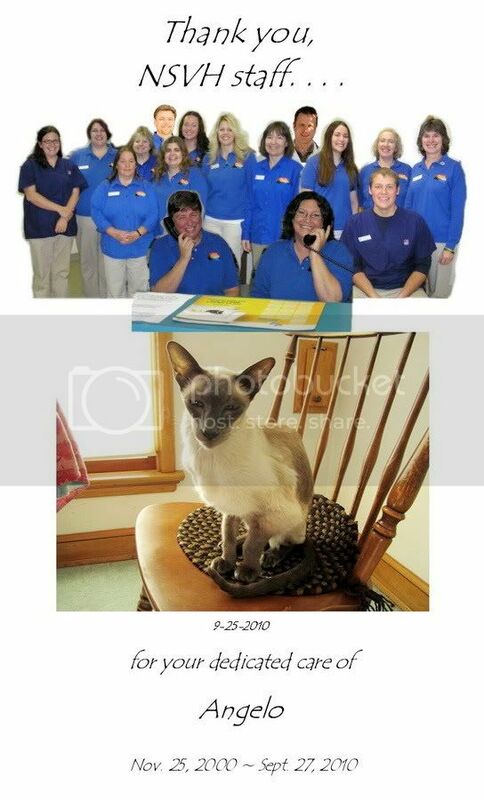 Below are picture pages, in actuality copies of the pages of a multi-page thank-you card I sent to the veterinary staff. I have made a picture thank-you card each time one of our cat-children have died, if only for the therapy of it, going through the cat's photos, telling his or her story. But this time I wanted to make it extra special because the front desk staff, and the technicians and veterinary assistants who performed all those hydration therapies since Dec., have been so good to Angelo. 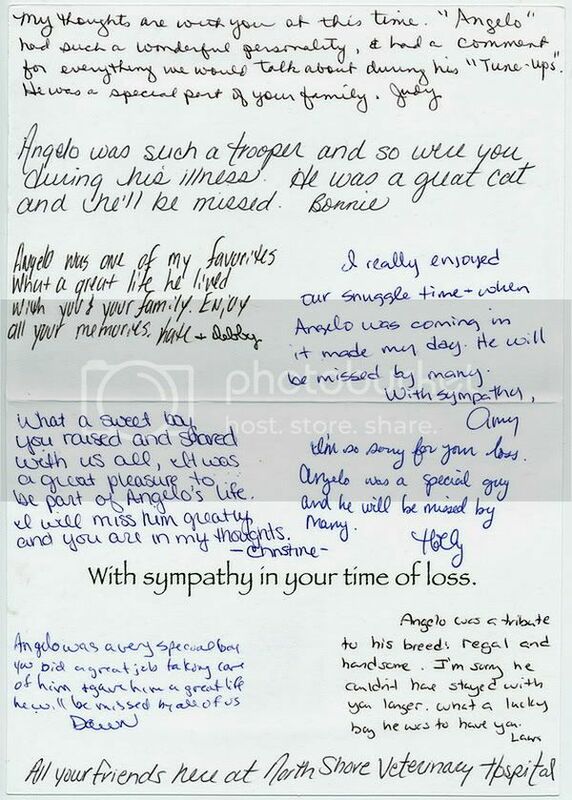 The veterinary practice sent us a sympathy card already, which they always do, but this time it was filled with extended entries from staff members who worked with Angelo. I'll attach a scan of it at the end. It meant a lot to us. Obviously, we spent a lot of money there, so there's that. But spending a lot of money does not require workers to share their feelings about caring for a pet in what is a routine card. They were so good with him. You'll be able to tell, I think, if you read their notes at the bottom. They really are a great bunch of people. Some of the typeface on the pages doesn't match because I erased our real names and typed in "my husband", "our daughter" and "me". I don't like our real names to be available to internet searches. What a beautiful, dear, wonderful tribute to this small life who found such a loving home with you. 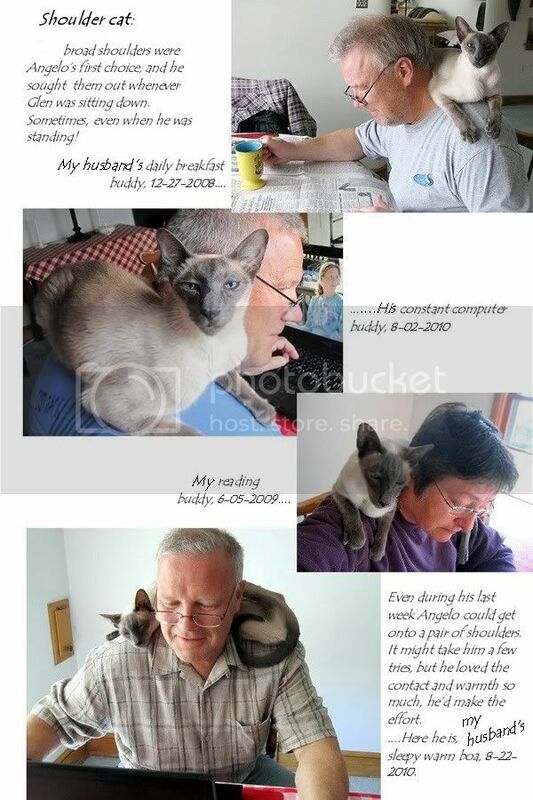 I just love the "bed buddies" photo as well as all of him on the shoulders of his beloved humans. You gave him all your heart, and received his in return. And in your heart he'll live always. When I saw your post and the subject, my first thought was, "Oh no, not Angelo!". My heartfelt sympathy to you and your family. I know that empty feeling, that "hole" that can't be filled when they've gone. 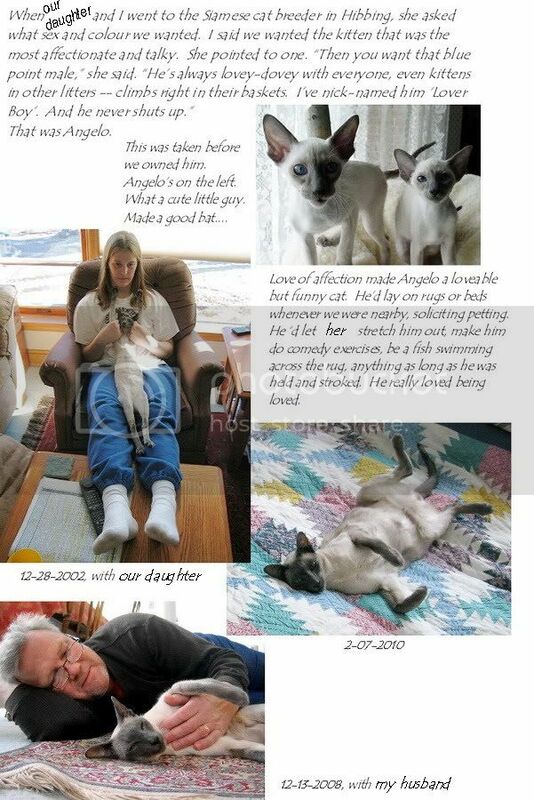 You've been a wonderful family to Angelo. 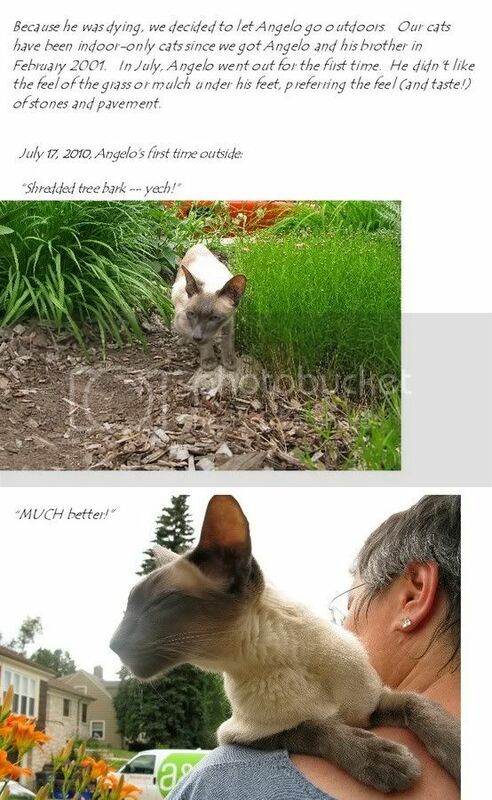 No cat could have been given more love. Big, big hugs to you, your husband and daughter. I know that empty feeling, that "hole" that can't be filled when they've gone. Oh, Mechtild -- I'm sorry to hear this news. Your love and devotion to Angelo is so very strong, and seeing those pictures really illustrates to me how much a part of your family he was. Those people at the vet's are caring folk indeed. I lost my Sam on September 1, one month shy of his 20th birthday so I know what you're going through. I'm so sorry for your loss. More than nineteen years of love and companionship! Gosh, that must have been wrenching, Ink Gypsy. My condolences to you, too. Sam was no doubt a cat who knew how lucky and loved he was -- which would make you miss him all the more. I'm so sorry for your loss. 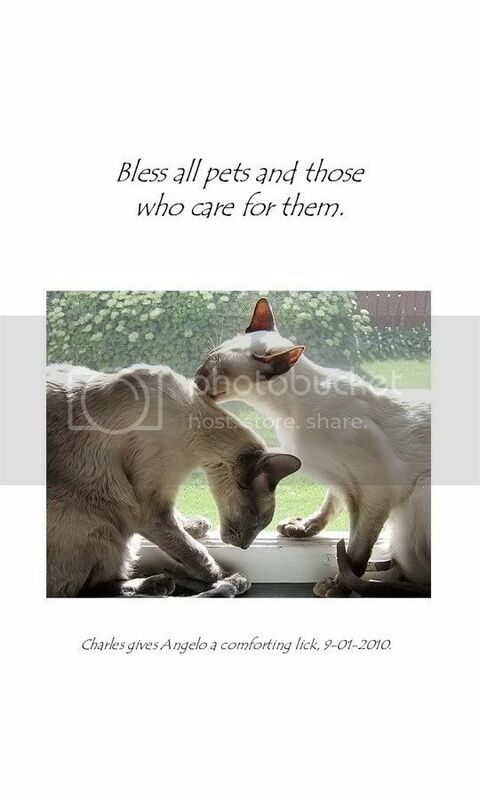 Our pets are so dear to us, they leave such a huge hole in our hearts when they go. They certainly do. But I wouldn't not have them, even with the pain it causes when they die. my friend.....somehow, it hurts just as much today as it did last week, when i read your news with disbelief. I'm so grateful that your family and Angelo were able to share a portion of the Road. My heart aches for you, but what a lovely book of memories! Angelo...I love that name and it fit him beauitifully. He was gorgeous and magestic and your angel boy wiht lots of spirit. I am so sorry for this. He really went way too soon. But, he had the perfect day, sniffing the air, hearing the buzz and birds, he went in peace with you there for comfort. Just a nap for him. Not for you though. I feel your heartache. Thank you for sharing these precious moments. I think Elsa and Charles are lovely...not as striking as Angelo (what a face!) but beautiful. hugs you so close. "Just a nap for him. Not for you though." That's the gift and sorrow of it. A gift for him not to anticipate death, his or anyone else's. But sorrow for us, we who know what's coming. Thanks for stopping in, Verangel. Your sensitive comments soothe. Yes, he was a beaut. The love of such beings is one of the most wonderful blessings in this world. But how is it going for your cats (including the "girls" who live outside)? These pictures are wonderful. I'm so very sorry for your loss. Best wishes to all of you. Thank you, Mariole. I hope Mr. Knightley and Mr. Bingley are doing well. They looked like they were getting on very well together in the last report. Aren't multiple cats fun? Mectild, I'm so sorry for your loss. I'm sure it never gets any easier. What a lovely tribute to Angelo. And you're right. The card from the vet's is very special.